I recently reviewed an interactive book-on-app called Civil War Truce for a Catholic website (see review). It was developed by the 5-woman team of Davis Studio. Civil War Truce tells the fascinating story of a young nun, Sr. Mary Lucy Dosh, whose lovely singing and tender care impacted the lives of countless Civil War soldiers. 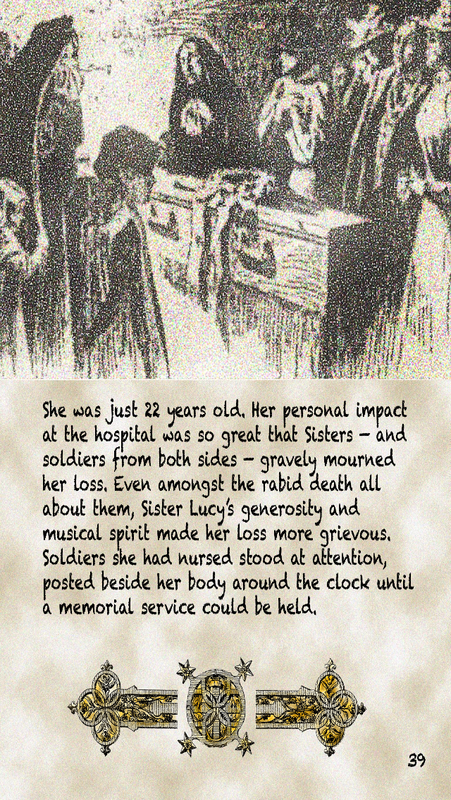 I saw many parallels between Sr. Lucy’s selfless and passionate commitment to the soldiers, and Louisa May Alcott’s. While Louisa ministered to the soldiers with her humor, storytelling (especially by becoming Dickens’ Sairey Gamp) and natural maternal instinct, Sr. Lucy quietly sang to her “boys” while caring for their needs. Each woman was fearless in her devotion to the men; each witnessed countless amputations, endured filthy hospital conditions and saw death on a daily basis. Each risked her life by exposing herself to infectious diseases. While Alcott’s service took place in Washington, D.C., Sr. Lucy and the Sisters of Charity of Nazareth served in Kentucky. To Alcott and Sr. Lucy, it mattered not whether the soldiers were Confederate or Union. Sr. Lucy was originally known as Barbara Dosh. Her original goal in life was to be “admired, to have money and pleasure, and enjoy myself in the world.” She attracted admirers with her gracious singing and was eventually adopted by the wealthy Stout family who granted her every wish. Barbara had spent several years at St. Vincent’s Academy before being adopted by the Stouts and felt homesick for her companions, the sisters. This helped to instill in her the call to the religious life. From there she and the other sisters were called to serve as nurses during the Civil War. 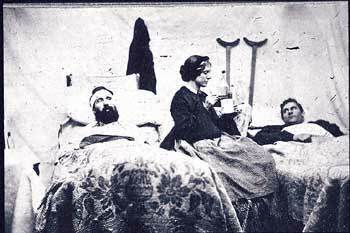 Like Alcott, Sr. Lucy contracted typhoid but unlike Alcott, did not survive. Both women however, impacted the lives of the soldiers in such a degree that they were honored by them: soldiers who had been attended to by Sr. Lucy stood by her body round the clock until a memorial service could be held. In Alcott’s case, the Concord regiment stopped in front of her home at Orchard House (where she had been sent due to the typhoid, and pneumonia) and gave her a salute. Alcott’s lasting legacy of course was Hospital Sketches. 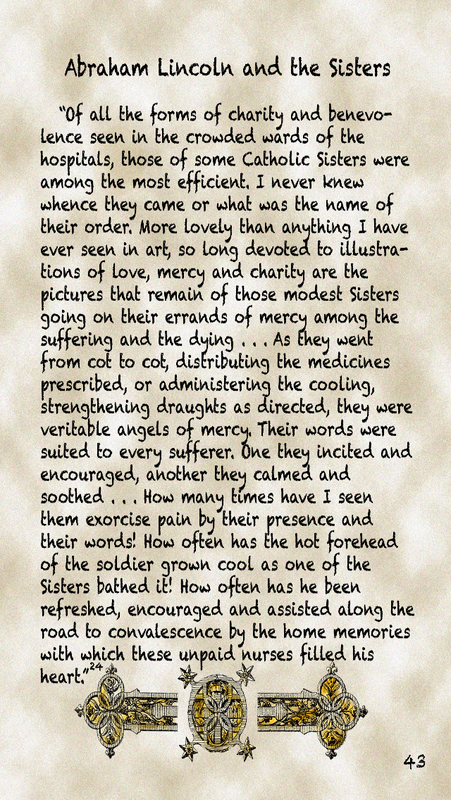 Abraham Lincoln praised the sisters in “all forms of benevolence and charity;” their devotion to the soldiers and their efficiency in their work—his full statement can be read in the accompanying graphic. Civil War Truce offers the fascinating and well-researched story of courage, compassion and charity shown by women the religious life in service to our soldiers. 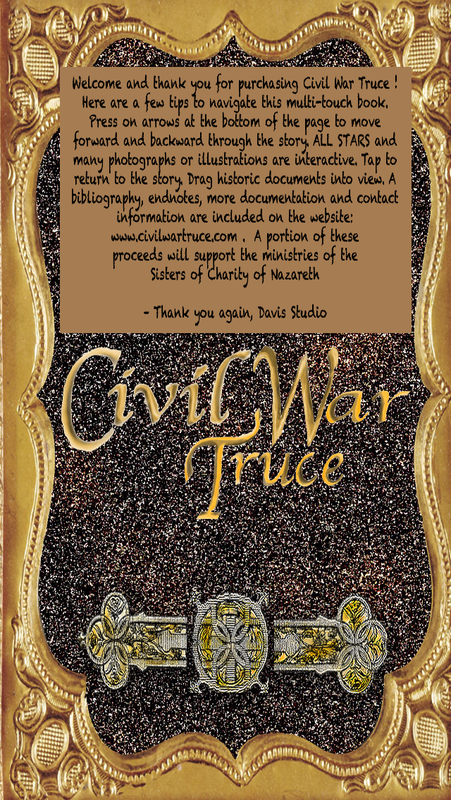 You can find out more about Civil War Truce at www.civilwartruce.com. You can download it to your Apple on Android device; the cost is $2.99. As previously mentioned, the app is an interactive book with animation, sound effects, old films and vintage photographs. The layout is attractive and reminiscent of the Civil War era. Exhaustive notes and a bibliography are provided. I recommend viewing it on a tablet as the type is quite small. On the subject of mid-19th c. medicine, I tried looking up “tuberculosis of the nervous system with a wasting of the flesh”—- but it just got the search engines all confused, and they just kept giving me regular TB. Do you know anything about TB of the nervous system? I don’t but I know a couple of people who should. I will write to them and find out.